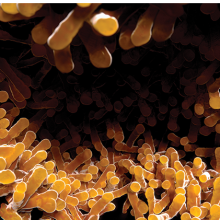 Using a large CRISPR-based screen, researchers find possible genetic culprits for patients not having success with immune checkpoint inhibitors. Design of the CRISPR-based screen. 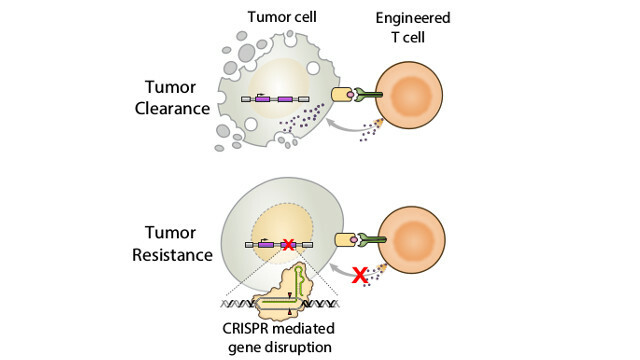 Anti-tumor T cells kill a target cancer cell (top panel). Disruption of a target gene reduces or eliminates the ability of cytotoxic T cells to vanquish the tumor (bottom panel).SHASHANK PATEL, NCI, NIH Immune checkpoint inhibitor antibodies are a relatively new class of cancer drugs that are now approved to treat patients with late-stage melanoma and those with certain lung, bladder, head and neck, kidney, and other types of late-stage cancers. 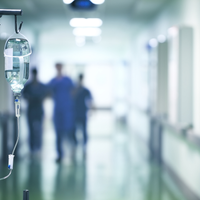 Some patients respond and go into long remissions when treated with these therapies, while others fare worse. Using a genome-wide CRISPR-based screen, researchers at the National Cancer Institute (NCI) and their colleagues identify protein-coding genes that must be expressed by a tumor in order for this type of cancer immunotherapy to work. The results are published today (August 8) in Nature. Focusing on CD8+ effector T-cells—the immune cells activated by immunotherapies based on immune checkpoint inhibition—the authors wanted to identify the genes that, when mutated, would result in tumor resistance to immune checkpoint inhibitors. These same genes, when functional, facilitate recognition of the tumor cells by T-cells. To do this on a genome-wide scale, Nicholas Restifo of the NCI and his colleagues used a genome-sized CRISPR-Cas9 library of more than 100,000 single guide RNAs targeted to protein-coding genes in human melanoma cells. 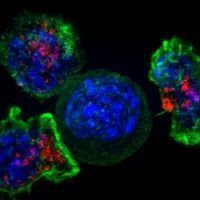 The team then assayed whether the tumor cells, when harboring a single mutation, could be killed by human CD8+ T cells engineered to express a recombinant T-cell receptor specific for an antigen present on the melanoma cells (these are called neoantigens). In this way, the researchers identified 554 candidate genes that could be necessary for T-cell-mediated tumor destruction and, when mutated in tumor cells, could confer resistance to immunotherapies that work by activating T cells. The researchers found that mutations in the genes they identified in their screen were enriched among patients who did not respond to the anti-CTLA4 immune checkpoint antibody, ipilimumab (brand name Yervoy). Restifo and his team also compared their candidate genes with the Cancer Genome Atlas database of tumor-mutated human genes across 36 different tumor types and found eight that were mutated in more than 100 patient tumors. Among the genes identified, the team homed in on APLNR, which encodes a G-protein-coupled apelin receptor that has not been previously associated with immune system function. APLNR, which was previously found to be mutated in several different tumor types, could modulate interferon-γ responses in a tumor mouse model. The team recapitulated several of the APLNR mutations found in humans in two melanoma mouse models and treated the animals with adoptive T-cell therapy. They found that the efficacy of the immunotherapy was lower compared to mice with a wild-type copy of APLNR. “APLNR modulates cytokine signaling in tumor cells and in doing so, helps boost the activity of genes involved in the processing and presentation of antigens that serve as beacons for T-cell recognition,” Restifo explains. “The work highlights the importance of defects in interferon signaling for resistance to cancer immunotherapy,” notes Pardoll, who adds that the genes involved in interferon signaling do not appear to be commonly mutated in cancers. Indeed, 541 of the 554 genes identified in the study had functions other than interferon signaling. “We still don’t know how most of the genes we found in our studies work to enable T-cell recognition of tumors,” says Restifo. The team also compared the genes they identified to a dataset of 204 tumor exome sequences from patients treated with an immune checkpoint inhibitor. The researchers found that mutations in the genes they identified in their screen were enriched among patients who did not respond to the anti-CTLA4 immune checkpoint antibody, ipilimumab (brand name Yervoy). In contrast, mutations in these genes were not enriched among patients who did respond to the therapy. Some of these genes, whose possible role in T-cell activation still need to be explored, include SOX10, which encodes a transcription factor involved in embryonic development and is found to be overexpressed in melanoma, and BBS1, which codes for the Bardet-Biedl syndrome 1 protein that likely plays a role in the development of several organs including the heart. Others include RPL23 and RPL10 that encode ribosomal protein components of the 60S ribosomal subunits. 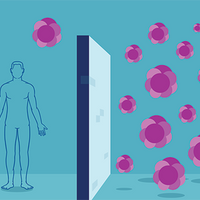 With this study, “we are gaining an increasing molecular understanding of how cancer cells react to T cells and how some may develop resistance,” writes Ribas. For Restifo, the ultimate goal is to now use these genes as candidates to both develop enhanced immunotherapies for patients and to convert cancer patients from those who do not respond to immunotherapies to those who do. S.J. Patel et al., “Identification of essential genes for cancer immunotherapy,” Nature, doi:10.1038/nature23477, 2017.